Background: Cytological grading is a useful tool for selection of therapy and prognosis in breast carcinoma. Despite having many cytological grading systems, there is still no agreement among pathologists to accept one of them as a gold standard. Aim: This study was undertaken to evaluate six such three-tier cytological grading systems to determine which system corresponds best to histological grading done by Nottingham modification of Scarff Bloom Richardson (SBR)'s method. Materials and Methods: In a double-blind study, preoperative cytological grades obtained by six systems on fine-needle aspiration cytology (FNAC) smears were compared by testing concordance, association and correlation with histological grade derived postoperatively by the SBR's method in 57 patients of breast carcinoma. Bivariate correlation studies and multiple linear regressions were done to assess the significance of the different cytological parameters to predict final cytological grades. Results: Robinson's system demonstrated the best correlation (ρ = 0.799; P = 0.000 and τ = 0.765; P = 0.000), maximum percent agreement (77.19%) and a substantial kappa value of agreement (κ = 0.62) with the SBR's grading system. All the six cytological grading systems correlated with histological grading strongly and positively. In multiple regression analysis, all of the cytological parameters of Robinson's system except cell size and nucleoli had significance in predicting the final cytological grade. Conclusions: Robinson's grading system is simple, more objective and reproducible, and demonstrated the best concordance with histological grading. So, Robinson's system should be used routinely for breast carcinoma aspirates. Keywords: Breast carcinoma; cytological grading; fine needle aspiration cytology; prognosis; three-tier system. The concept of nuclear grading was introduced by Black et al. in 1955. It was applied in cytological smears after modification by Fisher et al., or after simplification by Cajulis et al. There are numerous studies assessing nuclear grade in breast carcinoma in the last three to four decades. The parameters of grading eventually included architecture, background, dissociation of cells and many more, along with nuclear features. Numerous two-tier and three-tier grading systems were proposed. Some authors even advocated morphometric analysis , to enrich the grading systems. The study was conducted on 57 patients cytologically diagnosed as having breast carcinoma preoperatively who had undergone mastectomy with or without axillary lymph node dissection, over a period of 1 year (01.02.2009-31.01.2010), after obtaining the approval from the ethical committee of the institution. The inclusion criteria were: (i) all the clinically suspected and preoperative fine-needle aspiration cytology (FNAC) confirmed  patients (Category 5) of breast carcinoma who had undergone mastectomy in the Department of Surgery and (ii) patients who gave the consent and fully cooperated during the study procedure. The exclusion criteria were: (i) breast carcinoma patients not confirmed by cytology (other than Category 5) and/or (ii) patients having a history of preoperative chemotherapy or radiotherapy for breast carcinoma. Cytological grading was done by six of the three-tier grading systems in wet fixed Papanicolaou (Pap) stained FNA smears preoperatively [Figure 1],[Figure 2] and [Figure 3]. Histological grading was done on the mastectomy specimen using the Nottingham modification of SBR's method , in hematoxylin and eosin (H and E) stained sections [Figure 4]. Mitotic figures were counted and scored accordingly using an Olympus CH20i microscope with field of view number 18 and high-power field diameter 0.45 mm. The cytological and histological features and grades were independently evaluated by two examiners. In Fisher's modification of Black's nuclear grading, ,, depending on anisonucleosis, nuclear membrane, nuclear chromasia, nucleoli, chromatin pattern and mitoses, breast cancers were cytologically graded as nuclear grade (NG) 1, 2 and 3. Mouriquand's grading , gave a score of 0-3 to different cellular characteristics, nuclear features, nucleolus and mitotic figures. The tumors were graded I if the combined score was <5, II for a score ranging from 6 to 9 and III if the score was >10. Robinson's grading , used six different cytological parameters, namely cell dissociation, cell size, cell uniformity, nucleolus, nuclear margin and nuclear chromatin, to grade the tumors. A score of 1-3 was given to each of these parameters, and smears that scored in the range of 6-11 were graded I, smears with a score of 12-14 were graded II, and grade III was given for a score ranging from 15 to 18. All cancers were cytologically graded similarly using the SBR's method after doing Howell's  modification in mitotic counts. Six parameters, namely cellular pleomorphism, nuclear size, nuclear margins, nucleoli, naked tumor nuclei and mitotic count, were used to grade the tumors in the grading system proposed by Khan et al. A score of 1-3 was given to each of these parameters and the tumors were graded I if the combined score was 6-10, II for a score ranging from 11 to 14 and III if the score was from 15 to 18. The grading system proposed by Taniguchi et al. included seven cytological parameters - necrosis, cellular size, nuclear-cytoplasmic ratio, nuclear pleomorphism, nucleoli, chromatin granularity and density of chromatin. Excluding necrosis which was scored 0 or 1, all other parameters were scored from 1 to 3. The cancers that were scored in the range of 6-9 were graded I, those with a score of 10-11 were graded II, and grade III was given for cancers of score ranging from 12 to 19. Association between different grading systems was assessed by Chi-square test and Freeman-Halton extension of Fisher exact probability test. Correlations were judged by rank order correlation coefficients. Agreement or concordance was assessed by kappa measurement of agreement. Multiple linear regressions were done to assess the significance of different cytological parameters to predict final cytological grades. P value of 0.05 or less was considered for statistical significance. All the analyses were done using IBM SPSS statistics software, version 19. In the present study, 53 patients (93%) out of 57 patients were diagnosed as having invasive ductal carcinoma, not otherwise specified (IDC, NOS), and 4 were diagnosed as invasive lobular carcinoma (ILC) on histological sections. Fisher's modification of Black's nuclear grading (54.4%), Robinson's grading (47.4%), Howell's modification of SBR's system (54.4%) and Khan's grading system (50.9%) identified higher proportion of cases as grade II, but Mouriquand's (70.2%) and Taniguchi's (66.7%) grading systems diagnosed majority of cases as grade III [Table 1]. Pearson Chi-square (χ2 ) and Freeman-Halton extension of Fisher exact probability test revealed a very highly significant (P < 0.001) association between each of the cytological grading systems and SBR's histological grading system. 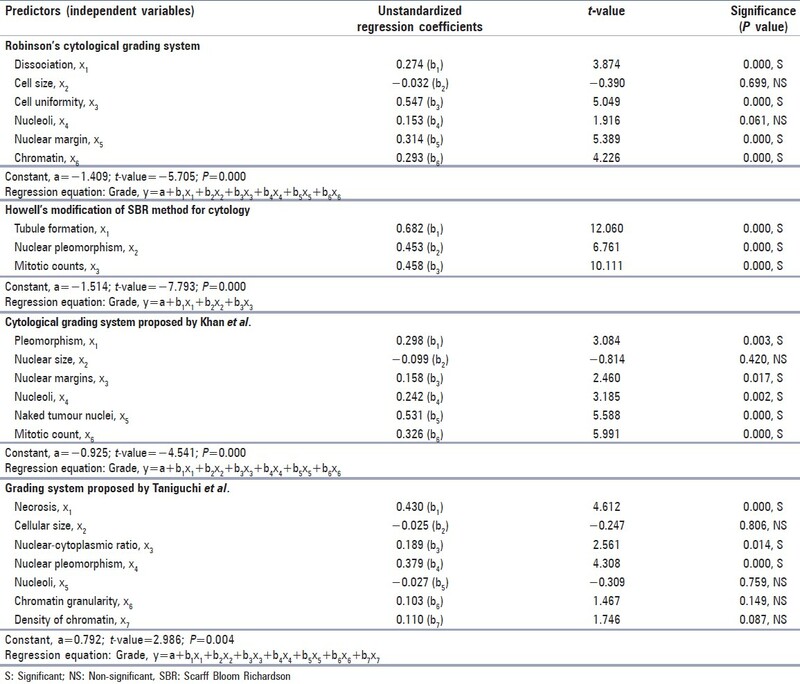 All the six cytological grading systems strongly and positively correlated with histological grading as analyzed by Spearman rank correlation coefficient (ρ) and Kendall's tau-b rank correlation coefficient (τ) [Table 2]. Absolute concordance or percent agreement between histological grading and cytological grading was maximum (77.19%; 44 out of 57 cases) in both Robinson's and Mouriquand's systems, but the kappa value of agreement was more favorable (κ = 0.62; substantial agreement) in case of the former [Table 2]. Among the six cytological grading systems studied, only four used objective scoring system in categorical order for each parameter. Fisher's modification of Black's nuclear grading has no scoring system for different parameters and Mouriquand's grading has scoring system for parameters but not in rank or categorical order. So, correlation and multiple linear regression can be applied in the remaining four grading systems. In the present study, all of the cytological parameters correlated strongly with the final cytological grade in Robinson's system, Howell's system and Khan's system. But in the grading system proposed by Taniguchi et al.,  nuclear-cytoplasmic ratio had a non-significant weak correlation with the final grade. In multiple regression analysis [Table 3], all the cytological parameters of Robinson's system except cell size and nucleoli had high significance in predicting the final cytological grade. In Howell's system, all parameters were found to have significance in detecting the final corresponding grade. But in Khan's system, one parameter, i.e., nuclear size, and in Taniguchi's system, four out of seven parameters had non-significant role in finalizing the grade. In the present study, percent agreement was maximum between two examiners in case of Howell's system followed by Mouriquand's, Robinson's, Khan's and Taniguchi's in decreasing order. All of the six grading systems revealed substantial agreement (0.61-0.80) in respect to kappa value, except Taniguchi's system which showed moderate agreement (0.41-0.60) [Table 4]. In a double-blind study conducted by Das et al. cytological grading of 52 patients with breast carcinoma was carried out using two different grading systems (Robinson's and Mouriquand's methods) and the grades were compared with the histological grading. Robinson's cytological grading revealed an absolute concordance with histological grading in 37 cases (71.2%) and similar concordance was seen in Mouriquand's grading. But they considered Robinson's method as a better choice due to its simplicity, specificity and better reproducibility. They also observed a clustering of cases in lower grades in Robinson's system and higher grades in Mouriquand's system, which was quite similar to our study. Frias et al. evaluated cytological grade by using the Robinson's method and the histological grade by using the Elston modification of the Bloom-Richardson method on 100 patients of IDC, NOS. A statistically significant association was observed between cytological and histological grades (P < 0.0005). Howell et al. used the SBR's system for cytological grading with some subtle modifications. Two pathologists assigned same cytological grade in 65.7% cases but same histological grade in 74.3% cases in the same set of patients. Percent agreement between histological grade and cytological grade by two pathologists were 51.1% and 40%. The percent agreement between histological grading by one pathologist and cytological grading assigned by the other pathologist were 45.7% and 57.1%, respectively. A very strong correlation was found between cytological and histological grading. Similarly, different agreements were observed in different studies comparing Robinson's cytological grading with histological grading by the Nottingham modification of SBR's system. The agreement was 57% (160 of 281) by Robinson et al.,  71.2% (37 of 52) by Das et al.,  65% (39 of 60) by Chhabra et al.,  83% (59 of 71) by Meena et al.,  88.89% (16 of 18) by Bhargava et al.,  81% (48 of 59) by Sinha et al.,  88% (38 of 43) by Khan et al.,  64% (32 of 50) by Lingegowda et al. and 77.19% (44 of 57) with κ =0.62 (substantial agreement) in the present study, which is almost similar to the other above-mentioned studies. The agreements that were observed comparing the Nottingham modification of SBR's system used for cytological grading with the histological grading by Nottingham modification of SBR's system are 57.1% by Howell et al.,  87% by Dabbs and Silverman,  50% (9 of 18) by Bhargava et al.,  82% (41 of 50) by Lingegowda et al. and 63.16% (36 of 57) with κ = 0.40 (fair agreement) in the present study using Howell's modification. Correlation of histological grading with cytological grading by Robinson's system revealed a correlation coefficient of 0.537 in the study by Chhabra et al. and 0.774 by Frias et al.,  indicating strong positive correlation. Lingegowda et al. found a correlation coefficient of 0.519 between Robinson's and histological grading and 0.720 between Howell's modification of SBR and histological grading. Bhargava et al. compared three different cytological grading systems, namely Nottingham modification of the SBR's method for cytology, Fisher's modification of Black's nuclear grading and grading by Robinson's methods. Robinson's cytological grading system was found to have the best correlation with histopathology grades (P < 0.001). All the six cytological grading systems were strongly and positively correlated with histological grading in the present study. Khan et al. applied their proposed cytological grading on 105 cases of IDC, NOS, and observed absolute concordance with histological grading in 97% (102 out of 105) cases. The concordance rate with histology was 100% for grade 1, 98% for grade 2 and 93% for grade 3. Overall concordance was 97.14% (102 of 105 cases). Taniguchi et al. implemented their grading system with seven parameters and histological grading on 90 cases (only cytological grading in 104 cases) of IDC and observed positive correlation (r = 0.337, P = 0.0015) between histological and cytological grading. Absolute concordance was 44.4% (40 out of 90). Studies on correlational statistics of cytological features with cytological grade are mostly available on Robinson's grading system. Chhabra et al. found strong correlation between each cytological feature and cytological grade, whereas Lingegowda et al. observed strong correlation between each cytological feature and cytological grade except dissociation in case of Robinson's grading system. In the present study, all the cytological parameters correlated strongly with the final cytological grade in Robinson's system, Howell's system and Khan's system. But in the grading system proposed by Taniguchi et al., nuclear-cytoplasmic ratio had a non-significant weak correlation with the final grade. Robinson et al. found all the cytological features of their grading system to have influential role in detecting histological score in multiple regression analysis, and cell dissociation and appearance of nucleoli came out as the most powerful predictive factors. Chhabra et al. noticed cell dissociation and nucleoli as the most influential predictive factors, whereas Khan et al. found all the cytological features to have influential role in detecting final Robinson's grade in regression analysis. Lingegowda et al.,  in multiple regression analysis of cytological features in Robinson's system, found that the extent of cell dissociation, appearance of nucleoli and nuclear margin had the most influential role in detecting the final cytological grade. Cell size, cell uniformity and chromatin pattern came out as non-significant predictors. In our study, all the cytological parameters of Robinson's system except cell size and nucleoli had highly influential role in predicting the final cytological grade. In Howell's system, all parameters were found to have significant influential role in detecting the final corresponding grade. But in Khan's system, one parameter, i.e., nuclear size, and in Taniguchi's system, four out of seven parameters had non-significant role in finalizing the grade. Regarding inter-examiner variability, very few studies are available. Howell et al. found inter-examiner agreement of 74.3% in histological grading and 65.7% in cytological grading. In our study, substantial agreement (kappa value: 0.61-0.80) was observed in histological grading and all cytological grading, except in Taniguchi's grading where we got the kappa value in the moderate agreement range (0.41-0.60). The variations of kappa value indicate subjectivity in the assessment of cytological parameters. In the present study, Robinson's system revealed the best kappa value of agreement (κ = 0.62; substantial agreement), maximum percent of agreement (77.19%; 44 out of 57 cases) and the best correlation (κ = 0.799; P = 0.000 and κ = 0.765; P = 0.000) with histological grading. It also demonstrated inter-observer agreement in a substantial range (κ = 0.71). The present study revealed that it is possible to grade invasive breast carcinoma on aspirates and cytological grade corroborates well with histological grade by SBR's method. Among the six three-tier cytological grading systems, Robinson's system is simple, more objective, takes little time and effort, is reproducible and correlates precisely with SBR histological grade as evident from the statistical analysis in our study. So, it can be used for routine evaluation of aspirates of breast carcinoma. The authors would like to thank Late Prof. (Dr.) Raghunath Pramanik for his guidance in the study. 1. Taniguchi E, Yang Q, Tang W, Nakamura Y, Shan L, Nakamura M, et al. Cytologic grading of invasive breast carcinoma. Correlation with clinicopathologic variables and predictive value of nodal metastasis. Acta Cytol 2000;44:587-91. 2. Bhargava V, Jain M, Agarwal K, Thomas S, Singh S. Critical appraisal of cytological nuclear grading in carcinoma of the breast and its correlation with ER/PR expression. J Cytol 2008;25:58-61. 3. The uniform approach to breast fine needle aspiration biopsy: A synopsis. Acta Cytol 1996;40:1120-6. 4. Black MM, Opler SR, Speer FD. Survival in breast cancer cases in relation to the structure of the primary tumor and regional lymph nodes. Surg Gynecol Obstet 1955;100:543-51. 5. Fisher ER, Redmond C, Fisher B. Histologic grading of breast cancer. Pathol Annu 1980;15:239-51. 6. Fisher ER, Gregorio RM, Fisher B, Redmond C, Vellious F, Sommers SC. The pathology of invasive breast cancer. A syllabus derived from findings of the National Surgical Adjuvant Breast Project (protocol No. 4). Cancer 1975;36:1-85. 7. Cajulis RS, Hessel RG, Hwang S, Haines K, Frias-Hidvegi D, O'Gorman M. Simplified nuclear grading of fine-needle aspirates of breast carcinoma: concordance with corresponding histologic nuclear grading and flow cytometric data. Diagn Cytopathol 1994;11:124-30. 8. Moroz K, Lipscomb J, Vial LJ Jr, Dhurandhar N. Cytologic nuclear grade of malignant breast aspirates as a predictor of histologic grade: Light microscopy and image analysis characteristics. Acta Cytol 1997;41:1107-11. 9. Kalhan S, Dubey S, Sharma S, Dudani S, Preeti, Dixit M. Significance of nuclear morphometry in cytological aspirates of breast masses. J Cytol 2010;27:16-21. 10. Ellis IO, Schnitt SJ, Sastre-Garau X, Bussolati G, Tavassoli FA, Eusebi V, et al. Invasive breast carcinoma. In: Tavassoli FA, Devilee P, editors. World Health Organization classification of tumours: pathology and genetics of tumours of the breast and female genital organs. Lyon, France: IARC Press; 2003. p. 13-59. 11. Elston CW, Ellis IO. Pathological prognostic factors in breast cancer: The value of histological grade in breast cancer: experience from a large study with long-term follow-up. Histopathology 1991;19:403-10. 12. Abati A, McKee G. Grading of breast carcinoma in fine-needle aspiration cytology. Diagn Cytopathol 1998;19:153-4. 13. Cajulis RS, Hessel RG, Frias-Hidvegi D, Yu GH. Cytologic grading of fine needle aspirates of breast carcinoma by private practice pathologists. Acta Cytol 1997;41:313-20. 14. Mouriquand J, Gozlan-Fior M, Villemain D, Bouchet Y, Sage JC, Mermet MA, et al. Value of cytoprognostic classification in breast carcinomas. J Clin Pathol 1986;39:489-96. 15. Mouriquand J, Pasquier D. Fine needle aspiration of breast carcinoma: A preliminary cytoprognostic study. Acta Cytol 1980;24:153-9. 16. Robinson IA, McKee G, Nicholson A, D'Arcy J, Jackson PA, Cook MG, et al. Prognostic value of cytological grading of fine-needle aspirates from breast carcinomas. Lancet 1994;343:947-9. 17. Robinson IA, McKee G, Kissin MW. Typing and grading of breast carcinoma on fine-needle aspiration: Is this clinically useful information? Diagn Cytopathol 1995;13:260-5. 18. Howell LP, Gandour-Edwards R, O'Sullivan D. Application of the Scarff-Bloom-Richardson tumor grading system to fine-needle aspirates of the breast. Am J Clin Pathol 1994;101:262-5. 19. Khan MZ, Haleem A, AI Hassani H, Kfoury H. Cytopathological grading, as a predictor of histopathological grade, in ductal carcinoma (NOS) of breast, on air-dried Diff-Quik smears. Dign Cytopathol 2003;29:185-93. 20. Das AK, Kapila K, Dinda AK, Verma K. Comparative evaluation of grading of breast carcinomas in fine needle aspirates by two methods. Indian J Med Res 2003;118:247-50. 21. Robles-Frías A, González-Cámpora R, Martínez-Parra D, Robles-Frías MJ, Vázquez-Cerezuela T, Otal-Salaverri C, et al. Robinson cytologic grading of invasive ductal breast carcinoma: Correlation with histologic grading and regional lymph node metastasis. Acta Cytol 2005;49:149-53. 22. Dabbs DJ. Role of nuclear grading of breast carcinomas in fine needle aspiration specimens. Acta Cytol 1993;37:361-6. 23. Zoppi JA, Pellicer EM, Sundblad AS. Cytohistologic correlation of nuclear grade in breast carcinoma. Acta Cytol 1997;41:701-4. 24. Chhabra S, Singh PK, Agarwal A, Bhagoliwal A, Singh SN. Cytological grading of breast carcinoma: A multivariate regression analysis. J Cytol 2005;22:62-5. 25. Meena SP, Hemrajani DK, Joshi N. A comparative and evaluative study of cytological and histological grading system profile in malignant neoplasm of breast: An important prognostic factor. Indian J Pathol Microbiol 2006;49:199-202. 26. Sinha SK, Sinha N, Bandyopadhyay R, Mondal SK. Robinson's cytological grading on aspirates of breast carcinoma: Correlation with Bloom Richardson's histological grading. J Cytol 2009;26:140-3. 27. Khan N, Afroz N, Rana F, Khan MA. Role of cytologic grading in prognostication of invasive breast carcinoma. J Cytol 2009;26:65-8. 28. Lingegowda JB, MuddeGowda PH, Ramakantha CK, Chandrasekar HR. Cytohistological correlation of grading in breast carcinoma. Diagn Cytopathol 2011;39:251-7. 29. Dabbs DJ, Silverman JF. Prognostic factors from the fine-needle aspirate: breast carcinoma nuclear grade. Diagn Cytopathol 1994;10:203-8.